The Richard E. Berry Educational Support Center in Houston, TX recently completed a major update to its AV systems featuring seven Allen & Heath dLive S Class Digital Mixing Systems and an ME Personal Mixing System. Serving the Cypress Fairbanks Integrated School District, as well as the Houston area at large, the Berry Center hosts an amazing 4,000 yearly events in its five multipurpose venues—an arena, conference center, theater, and two stadiums. Ford Audio Video Systems provided the Berry Center’s new AV systems. “Our big goal in all of this was flexibility because the Berry Center defines multiuse facility,” said David Shriver, Ford AV’s Houston Division job center manager. Ford AV installed an Allen & Heath gigaACE network and a second Dante network to supplement the Berry Center’s existing Dante network. Together, the three networks allow several of the dLives to be relocated when needed and facilitate resource sharing, recording, and live and streaming broadcast from any venue. The Berry Center’s Conference Center can be subdivided into as many as 17 separate spaces and Shriver noted, “One of the brilliant things with the dLive is that we could give them the flexibility to run each of these spaces as independent systems from one MixRack using an iPad or a laptop with the dLive Director software.” Portable dLive Surfaces also allow separate FOH and monitor mixing for larger arena events and FOH mixing from an audience location in the theater. The Center’s ME Personal Mixing System serves performers in the arena, theater, or other venues as needed. “We have a standard, operational scene for each venue with at least one layer reserved for the engineer to set up and patch as needed and we’re using dLive processing for events like music groups in the theater,” said Sean Ramsey, Berry Center’s technical systems manager. 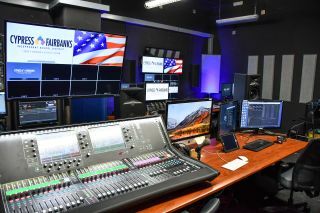 Many Berry Center events include broadcast and recording from the shared production/broadcast room, and Ramsey said, “We may do 25 graduations in a year and each of those requires a stream. We also have live TV for the district through a public access channel.